Magic: Puzzle Quest Spotlight: Player Profile and Player Level - D3 Go! It’s finally time to unveil all aspects of our newest big addition, the Player Profile and its intricacies. 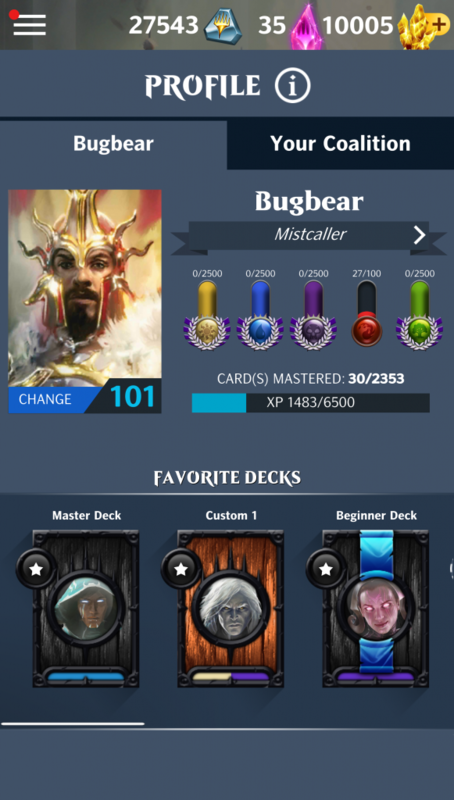 As announced on our previous post, this feature provides you with a customizable public profile, with avatar, title, and slots for selecting your favorite decks for easy access on events. Access can be made through the Profile icon on the main menu. Avatars: A personal image displayed on the left of the screen, taken from a selection of cards available on MtGPQ’s card base. To select yours, simply tap “Change” on blue bar below the artwork. The two tabs at top of the screen allow you to choose between Planeswalkers and card arts. Tap the artwork you want to set and confirm it by tapping Accept.. Title: A statement, epithet, or battlecry, also taken from a selection of cards. To modify it, tap the title bar below your username (marked with an arrow “>”). Select your preferred title between the unlocked ones and confirm by tapping Accept. To unlock more options, you’ll have to obtain the card from the respective set on it’s relative Booster. Available options will be highlighted and locked ones, darkened. You can check the card that avatar or title is related to by tapping the option and holding on it for a second, and use the Card Finder on the lower right side to see which boosters can grant that card. Tap the empty star on a deck’s back: By tapping the star on the circular space on the left side of the back of a deck, one of your Favorite slots (at the top) will be filled. Once your Favorite Decks have been selected, they’ll be already saved. To remove a Favorite Deck, tap the Favorite slot. The Player Level progression is a way to track your progress in the game and receive additional rewards each time you gain a level. These include Mana Runes, Crystals and Jewels, Booster Packs and Favorite Deck slots — with more to come in the future. For now, levels can only be gained through mastering cards, but a variety of ways will be available when fully implemented. Right now, all veteran players will immediately receive a level boost and a pack of rewards based on their current progress in the game. The Player Profile, along with the Card Visual Aid (step-by-step and fast modes), represent the first time we’re able to develop content oriented to enabling players to customize their personal experience, and forms the basis for a series of future upgrades and new modes we have planned. Players can access other player profiles by tapping their usernames, either on the Coalition screen or before an encounter. You may experiment the Player Profile on the update releasing next week. New sections and content will be available on future content and collection updates. Have fun!